It’s time to shop for new flooring, but what option gives you everything you want from beauty to value and practicality? The answer to that question can be found in samples numbering in the hundreds at Ed's Flooring America. 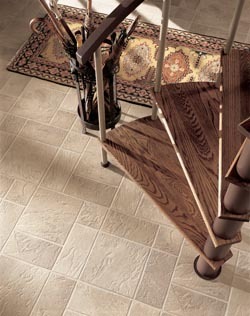 Let us show you our selection of luxury vinyl flooring in Plaistow, NH. From luxury vinyl tile to plank and resilient floor coverings, our flooring showroom provides you with products, sales, and service. Ready to work with you are our sales and design professionals. Armed with product knowledge and design training, they’re the ones who show you samples, share the details, and answer your questions. Come into our showroom to choose new floors for your home. Luxury Vinyl Tile - Ceramic, porcelain, or stone are classics that are popular materials for floor coverings. Whether you prefer the elegance of ceramic, the modern appeal of tile, or the rustic warmth of slate, our showroom has luxury vinyl tile in an assortment of colors that imitate tile or stone. These floor coverings deserve the name “luxury” because they are every bit as gorgeous and appealing as the real thing. Luxury also addresses the maintenance, because you don’t have to get down on the floor on your hands and knees and scrub. Instead, use a dry mop to sweep and a damp mop with a gentle soap to clean up. Luxury Vinyl Plank - What looks like hardwood, resists water, stands up to heavy foot traffic, and comes with a smaller price tag? Luxury vinyl plank. This flooring is easy on the feet and ears due to its vinyl construction, and easy on the eyes with its realistic appearance. It even comes in lengths that install much like planks. Resilient Flooring - This is vinyl that is manufactured to withstand impact from feet and paws and look as good as new. Our resilient surfaces are durable and long-lasting, yet have the ability to mimic high-end floors, such as tile and wood. Let us send a team of professional installers to your home to place these 6’ or 12’ sheets of vinyl. We also assist you with installation of vinyl tile and plank because we want your floors to remain beautiful for many enjoyable years. Contact us today to learn more about our luxury vinyl flooring. We proudly serve customers from Plaistow, Atkinson, Hampstead, Kingston, New Hampshire, as well as Haverhill, Massachusetts.